During the recent British Ultra Fest at Radley College there were a few nights I was on the night shift. As the lighting levels were low I was afforded a view of clear skies several times. The night sky represents, for me, at least to some extent, the unknown. 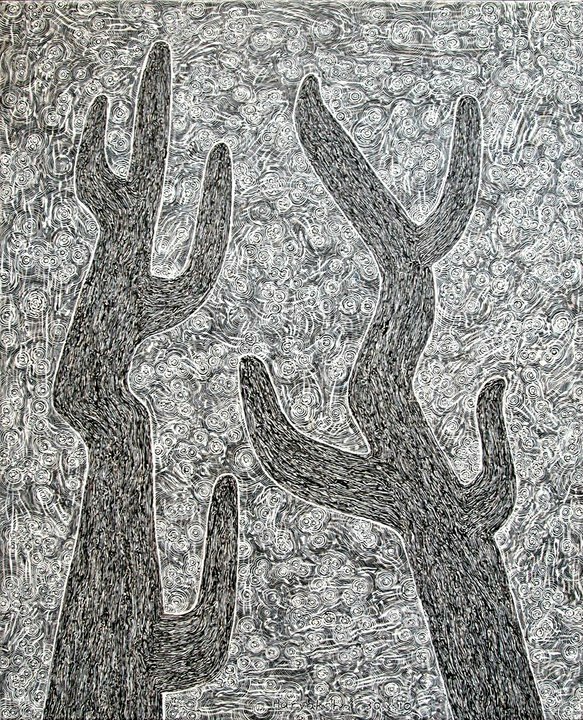 Looking at Haryaksha’s work I felt the intensity of his sky packed with living stars and at the same time in the Saguaros, physical processes of life – again a collection of unknown (to me) yet living dynamic processes. The backdrop to this is that I am reading a lot of Sri Aurobindo at the moment and in particular his writings about the veil of ignorance we live behind, our perception of ourselves and forces around us. Cat meets dolphin – a non-analytical approach.